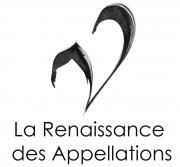 In an article in Le Monde concerning work that is done in the cellar and the position I am said to have on it, my perspective was not too strenuously sought, and it is necessary to make a few vital clarifications so that a reader can formulate his or her own opinion on the subject. If you want to generalize, there are two positions on cellar work, almost totally opposed to one another. 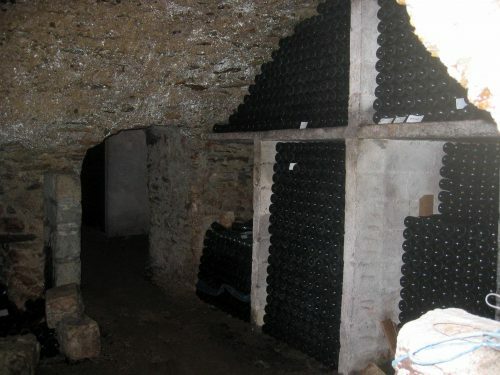 One position is that of permanent interventionist, in which case the cellar takes on the appearance of a laboratory. The second, you simply listen to what is happening, and actions are very measured and very few. In this case the cellar is a womb. In order to have the ability to follow the second path it is necessary to step back and rediscover – as more and more wine enthusiasts understand – the importance that agriculture plays in the quality of wine and the full expression of its site (in other words, its AOC). A simple example helps us better understand this reality. When you look at a vine in the spring, only some buds are visible. When you look at the vine in autumn it is covered with vine shoots, leaves and grapes (and we hope not much of anything else). These represent every year several tons of material per hectare that were not present in spring! If we removed the water from these shoots, leaves and gapes we would have what is called dry material. Too many people – myself included in the past – think that this dry material comes from the earth, when in fact only around 6% does! The rest comes from where? From photosynthesis! That is to say, light and heat are transformed by the vine into real matter that is in front of us every year! The intangible becomes tangible. When you understand this process deeply, you can easily see that everything that can trouble photosynthesis will trouble the organization, or the principals of balance, that the vine places on its grape. What materializes by photosynthesis, if the agriculture is healthy, if the plant is well connected to its archetypal force, always has a harmony and a potential equilibrium. The vine is a bit like a painter that knows how to seize the colors he or she is given and create a canvas that is a beautiful whole. We see in certain impressionist paintings how a color if it were alone would be too vivid, contributes to the general beauty of the canvas. The color too vivid for the vine is an imbalance that the climate can demonstrate in a given year. If the vine is balanced with the site or the plant, however, if it is well adapted – this is a real terroir! It will always have the ability to harmonize what could be “analytically” judged as a potential imbalance for the wine. The vine knows to include a stronger acidity or alcohol in a whole of elegance. For this reason when we taste we cannot always guess the level of alcohol or acidity. Conversely, to think that a weed killer, chemical manures, penetrating treatments or systems that get into the sap (more than 90% of actual treatments) have no effect on the wines, is to totally negate the artist’s role the vine has on its grape and to affect in the cellar the behavior of the must and the taste of the wine that will be born. We should never, and this point unfortunately is rarely understood, speak of the work we do in the cellar without first talking of the agriculture that we have undergo our vines. And if it is already biodynamic, we can also ask ourselves what is the biodynamic agriculture that we have given the vines? Is it adapted to the climatic profile of the year? There exists not a single biodynamics, but different possible utilizations of biodynamic preparations that we use at moments that vary in function with the plants for which they are destined. In the end biodynamics is the bringing of dynamics that reinforce exchanges. At a time when our atmosphere is becoming denatured and cannot transmit to the earth the impulses of the solar system, it is indispensable to reinforce these exchanges. It is for this reason biodynamics triumphs in viticulture around the world. It is not a question of trends but real effects on taste (if the actions taken were correct!). What does all this have to say indirectly about work in the cellar ? If your agriculture is healthy, if it is invigorated by biodynamics, your grapes will be able to attain full maturity, even if the weather is mediocre. A single biodynamic treatment, of several grams/herctare, of a silica judiciously prepared and then activated one hour in water before being passed on leaves and bunches, will considerably help a beautiful maturity and certainly stop rot. For reasons that we cannot explain here in detail but are addressed in detail in the 4th Edition of Wine: From to Earth, this treatment, though totally natural, must be used with prudence. With such an approach, of course there is of course no need to fall back on the terrible anti-rot products that we should also call retarders, or modifiers, of maturity! And also the natural yeasts that issue from the climatic profile of the year will not be destroyed or modified by these systematic treatments and can rapidly “open” in the cellar, that is to say, transform perfectly the climatic nuances of the year, in original aromas and harmony. An inoculation therefore seems ridiculous; as does concentration by osmosis or by cold. We don’t concentrate beautiful music! But this implies reasonable output. By that token healthy grapes will rarely if ever require washing (taking away bits of the grape’s juice), which eliminates at the same time vectors of originality. And, finally, filtration will not be necessary or will be minimal, because what is a harmonious ensemble can easily clarify by sedimentation. Let us repeat that all this is not possible if we poison the earth and the sap, if the vine has to fight to survive and to eliminate the poisons we impose on it. An artist can only work well when in the right conditions ! Everyone knows that when the laws of the earth are stronger than those of the sun, when gravity wins over the solar attraction after the autumnal equinox, the sap re-descends and small death takes place over the winter. In a little bit the same manner, we can, we must, understand that if photosynthesis is disturbed by molecules of synthesis – dangerous to the point that legal regulations state he who handles them a strict uniform and respiration mask – generative processes of taste and odor from solar origin cannot take place. So we have the desire to save the harvest or render it attractive, and interfere a great deal in the cellar. We have to do everything again, perfume everything, concentrate everything, do everything to balance because the sage laws of nature could not be expressed. The final product; is it good? Often today it is, but the taste of its site is no longer apparent. How many wines can be recognized in blind tastings today? Do you remember the wines of the 1950s from great sites, and the masterly demonstrations that we could give to foreigners visiting France? For the person deeply attached to his or her vines, who begins to understand that agriculture must again become an art, the permanent quest from spring to autumn will be to take the actions which allow the solar matter to come down as it should into the grape or, again, the actions that helps the macrocosm become microcosm, as said the ancient Greeks. Biodynamics knows how to do this. Only in the cellar are the actions simple. One of these important and misunderstood actions is the choice of the form in which the wine will be born. Though we are by our ancient architecture surrounded by remainders of what we should call “the science of forms”, most of the world ignores this today. The choice of a barrel’s shape – I don’t speak of new wood which is too often used as a cosmetic for a harvest without typicity – or of the amphora (see the upcoming 4th edition of Wine from Sky to Earth, Ellebore edition), are in my opinion the most appropriate. Then you have to watch that the fermentation takes place well and eventually, but rarely, re-blend. Then you have the batonnage, mixing the lees with the wine. And finally you leave everything to happen subtly during the calm of winter. All of this implies that the cellar be made of clean materials, in an area of amenable energy, with properly adopted forms, without these terrible 50/60 hertz pollutions that we find under practically every barrel as lighting(!) etc etc. How frightening this incomprehension will seem in several decades. Certain people, used to hearing of the veritably odyssey of cellar work, can be disappointed in light of such a plea and will claim lack of creativity, even idleness or lack of knowledge. In reality, the situation is the opposite and a return to deeper comprehension of the laws of life, which economic interests are chained to destroying. In reality, the greatest work a viticulturist does in the cellar is to be present and warmly admire the work he or she has accomplished. This sympathy wine receives across all its living organisms a little bit the way a beautiful countryside touches you. Everything is but information on earth before becoming a physical organism. We knew this a long time ago and chose forms appropriate to every food. True creativity must be used when the grape is still attached to the vine. 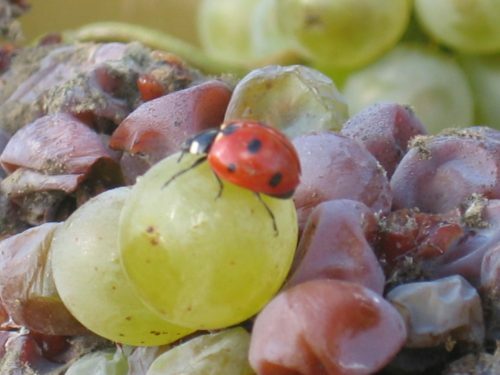 It is for this reason that more and more viticulturists are becoming “nature assistants” rather than “wine makers”. Lastly, a brief word on the sulfur that often becomes the tree which hides the forest. The use of sulfur, purely volcanic, is in many cases useful and impossible to circumvent. But in very precise conditions we can certainly make great wine without sulfur. We can finally summarize all this in saying that speaking of work in the cellar without speaking of agriculture first is contributing to the shutting off of a part of what is profoundly the nature of an AOC.